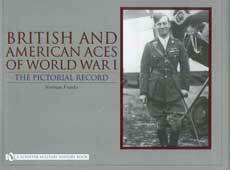 Covers the British and Commonwealth fighter aces of the Great War. One chapter covers the aces with ten or more victories, and an additional chapter lists the fighter aces with nine down to five victories, giving their squadrons, where they hailed from, and in many cases their subsequent fate. For the American aces, the author lists every fighter ace of the period, from Rickenbacker’s twenty-six down to those with five victories. 240 pgs, HB w/dust jacket, 11 x 8.5, 400+ photos.